If you’re trying to improve your golf game or you’re looking for a little help judging distances, then the best way to do this is by investing in a laser rangefinder. A rangefinder can help you to accurate know the distance between the tee off and the green by giving you an exact distance in yards. This kind of information can be a massive help for improving your golf game. Although there are a lot of rangefinders out there available, not all of them are worth considering. Though the big brands Bushnell and Nikon are great, there’s also some lesser known brands that you might want to think about as well. So, let’s take a look at some of the best rangefinders currently available. If you have a decent budget, then the Bushnell Tour V4 Shift is pretty unbeatable in terms of it’s effectiveness. It’s one of the best rangefinders currently available, and there’s a few reasons why you might want to consider adding it to your collection. Firstly, the best thing about the Tour V4 Shift is that it has Slope Switch Technology. This is easily turned on and off by a small switch on the side of the rangefinder itself. This easily allows you to go from estimating standard distances to more slope adjusted distances. This means that if you’re playing on very hilly terrain, it will allow you to estimate the potential sloping. Usually this is built into an additional device, but with the V4 Shift, you get everything in one device. It’s pretty much designed as the perfect rangefinder. It’s really easy to hold and use, due to the grips and the design of the rangefinder in general. It also has an additional vibrating option, which will automatically go off when you go over the flag on the green. This helps for picking out the exact point that you want to aim for. Another good thing about thing one is that it’s particularly light – it’s much lighter than other rangefinders that are currently available. If you’re trying to minimize the amount of stuff with you that you’re carrying around the course, then the Tour V4 Shift might be a great option for you. 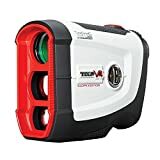 Although the Tour V4 Shift is pretty expensive, that doesn’t mean you have to spend a fortune on a good laser rangefinder. If you’re looking for one on a budget, then you don’t need to spend much more than $100. The Coolshot 20 is a great example of a budget rangefinder that works well. Whilst it doesn’t have the fancy slope features of more expensive rangefinders, it still does all of the basics extremely well. You’ll be able to measure distances of between 5-600 yards, which is surprisingly good considering it’s low price. Probably the best thing about this rangefinder is the way that it works for multiple targets. When you press the rangefinder button, it will scan the field continuously for 8 seconds. This can give you time to look at different targets, and the rangefinder will give you an accurate estimation for their distances. Overall, in terms of budget rangefinders, this is a pretty unbeatable option. If you’re looking to spend low and get high quality, then the Coolshot series is one to look at (though other Coolshot models are significantly more expensive). Aside from big brand names like Bushnell and Nikon, there are a ton of other camera models out there that you’ll also want to consider. A good example of this is the VPro500, from the aptly named brand TecTecTec. Although it has a relatively low distance measuring capability of around 550 yards, this doesn’t mean that you should overlook the VPro500. In fact, it’s still worth considering if you’re looking for a cheap rangefinder. It does all of the essentials extremely well, especially the quality of vision, which is really good on this rangefinder. It’s also water resistant, which is important if you’re going to be using it in harsher weather conditions. 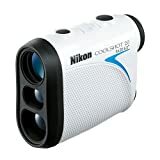 It’s another option for a lightweight rangefinder with pretty great accuracy, all at a relatively low price point. The older brother to the Tour V4 Shift is the Pro X2. It’s bigger, heavier – and more expensive than the Tour Shift. But, there are a couple of reasons why you might actually prefer it. Firstly, the reason that it’s heavier and bulkier is that it has a greater range. Depending on where you’re golfing and how advanced you are, this may or may not be necessary for you. It has a ridiculous range of around 1300 yards, which is more than adamant. if you’re a more advanced golfer, then this might prove to be the better choice. It also has the same slope technology as other Bushnell Rangefinders, which is ideal if you’re golfing in particularly hilly terrain. It’s also waterproof too, so you don’t need to worry about it breaking if you’re golfing in poor weather. It’s another good choice of rangefinder. The GoSky is another cheaper brand option that doesn’t cost you anything in terms of quality. 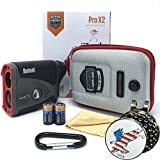 These types of rangefinders are awesome for using as golf tools, but you can also use them for a multitude of other things as well. It has a 6x magnification, which is really useful over long distances. If you’re viewing hundreds of yards into the distance, then its important to have a level of magnification that suits you. The film lens is good quality too – it uses porro prisms to project an accurate representation of what’s up ahead, which you’ll find in the majority of good binoculars. The GoSky doesn’t do anything that’s particularly amazing, but it does do pretty much everything well. So, it’s another option if you’re looking for a cheaper rangefinder. 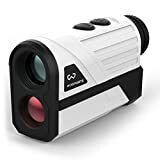 In terms of budget options, this WoSports Rangefinder is another option for those trying to keep costs as low as possible. It has a 600 yard range generally and a 180 yard flag lock range, which is about standard in comparison to other cheap rangefinders. Although it’s not fully waterproof, it is splashproof. This means that it can deal with a small amount of water, but if it gets submerged, then it’s not going to survive. It’s actually designed as much of a hunting rangefinder as it is for golfing, but this doesn’t mea that you should dismiss it entirely. It’s one of the cheaper models that actually has the ability to adjust with slope, which is usually reserved for more expensive rangefinders, But for a cheap option with a lot of capabilities, then this is undoubtedly a pretty decent choice. The Callaway 200 is one of the older models of golf rangefinder around. But, it’s definitely worth looking at if you want something small and compact. Although it’s hardly revolutionary, it does everything well and it has a surprising range of up to 800 years, which is great considering it’s price point. It’s very accurate, and you have the ability to scan across the field to identify different targets and distances. It uses what they call Pin Acquisition Technology, which is primarily designed to give you even more accuracy within shorter distances. This is another option to consider if you’re looking for a lightweight rangefinder. One of the main reasons to opt for a laser golf rangefinder is because of the sheer accuracy that’s possible with it. Although Golf GPS’s are getting better and better, they still are nowhere near as accurate as golf rangefinders. You can use a rangefinder to pinpoint the exact yardage from where you are to where you’re aiming (most likely the green, but also the fairway). So, for accuracy, a rangefinder is unbeatable. Better rangefinders will give you slope adjusted distances, which can make it much easier for you predict distances even if the terrain between you and the green is hilly. 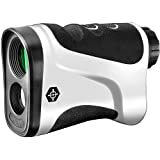 Although once upon a time golf rangefinders were only available to those that could afford the best brands, there’s been a real increase in quality amongst the cheaper brands recently. That means that even if you’re a novice or you’re on a tight budget, then a rangefinder is within your reach as an additional golfing tool. If you’re comparing a golf rangefinder to a GPS, then in terms of speed, the rangefinder wins hands down. You can get a distance within a few seconds of using a rangefinder, which makes it a great choice for those who don’t like waiting around. Overall, these are just some of the best laser rangefinders that you’ll find available on the market. Sure, there are more expensive ones available. But for the majority of people, you won’t need anything extremely complex and a basic rangefinder should do the trick nicely. A rangefinder can help you to improve your ability to comprehend distances over time. Also, if you’re looking to improve your putting game, then a good quality laser putting aid can also be useful for helping with this.